Welcome to the official website of the National Arrow & Arafura Association, the governing body for these two types of yachts in Australia. Arrow and Arafura Cadet owners are involved in organised sailing in New South Wales, Queensland, South Australia, Queensland and Victoria. There are also numerous boats in Darwin, the birthplace of the classes, and a few boats in West Australia. Like all light-weight catamarans, the Arrow and Arafura Cadet are fast and exciting sail-boats in a good breeze. In its 4.3m division, the Arrow is one of the fastest, with only modified versions of the Windrush and Hobie 14 having lower yardsticks. 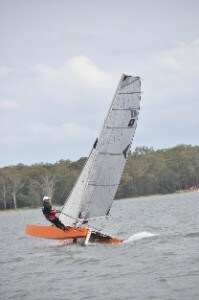 It is also rated faster than almost all off-the-beach monohulls, with the exception of the larger skiffs. The Arafura Cadet has no direct competitor but performs remarkably well for its size. Of course there is no substitute for waterline length and sail area and the 4.9 and 5.5m cats, most of which are of more modern design, are considerably quicker. However, in terms of value for money, performance and convenience, the Arrow and Arafura Cadet are hard to beat.